So, What If I Say Yes To Any of These Questions?! That new hearing aid means better hearing and a better quality of life. No more straining to understand a conversation and less anxiety about social and even family interactions. But it’s important to remember there is going to be a period of adjustment. Your voice is going to sound loud and maybe hollow and a little odd. You will hear chewing and swallowing differently. 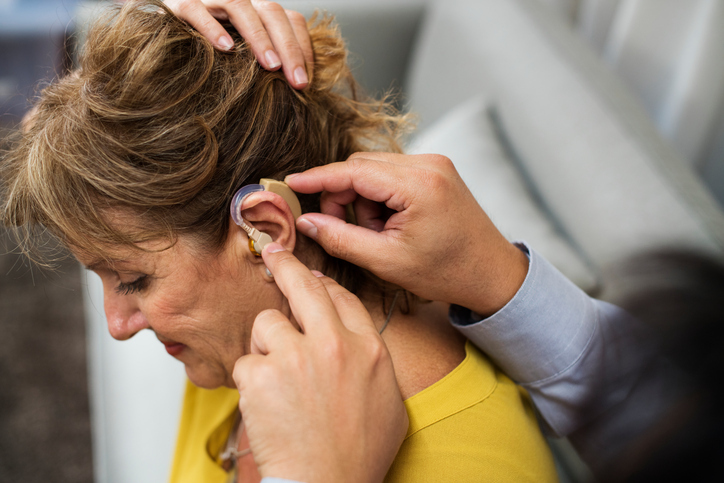 There will be physical sensation issues with a hearing aid on or in your ear and there may be some initial problems distinguishing background noise. Here are some things to remember to help with the adjustment. With new hearing aids, your brain has got a lot of new sound to process that it hasn’t had to deal with for a while. The clock ticking, the refrigerator icemaker, the dog’s toenails on the kitchen floor, the rustle of clothing are new and loud. Your brain is going to adjust and start processing the new sounds as background sounds again. And everyone adjusts differently, so if a friend tells you they had no issues, don’t feel something is wrong if it’s taking your brain a longer time to adjust. It could take weeks or even months and that’s not unusual. The “new” sounds will eventually fade into the background and you will be able to concentrate on specific and important sounds again. You wouldn’t jump into the deep end of the pool without practice at the shallow end. It’s the same with new hearing aids – you need to practice! Wear them for a couple of hours at a time – maybe during breakfast and then later at the dinner table. Gradually increase the wearing time each day. You need to get used to hearing your own voice, so reading out loud or carrying on a conversation with the television or a pet can help you adjust. Your loved ones can help you determine if you are speaking too loudly or too softly. When you feel comfortable with your hearing aids at home, try them out in different situations – the mall, a restaurant, church – so you get used to the new sounds. You need a rest from processing, so don’t start out wearing them all the time. You have to get used to the physical sensations of wearing them. Your hearing is going to be a lot better than before, but just like eye glasses correcting your vision, they will not permanently restore your hearing to 100% accuracy. But you will be relieved of the stress of straining to hear or guessing at the conversation going on around you. Set attainable goals to help chart your personal progress, like keeping the television at a certain level or understanding several conversations at once at the dinner table or while you are out. Setting a goal and then accomplishing it will show you are making positive progress. Do take notes during the adjustment period and discuss what you see as issues when you meet with your hearing specialist or audiologist. Is there a certain sound level you are having trouble adjusting to or some physical issues that should be addressed? Feel free to contact us at Accurate Hearing Systems. Many times, just a slight adjustment will take care of the issue. Our team at Accurate Hearing Systems can help you make adjustments at your follow up appointments with us. Make sure you come by! Especially in the beginning, you may find that an adjustment or two will help your hearing aid experience. If you remember these tips for adjusting to new hearing aids – you’re going to do great! The new noises will take some getting used to, but it will pay off in big dividends because your stress in social situations and the workplace will be alleviated. You can go to the movies and not worry about missing the storyline or carry a conversation on at a restaurant. You will find you are enjoying life a lot more. Track your progress on your goals to stay focused on your achievements. Don’t hesitate to call our office if you have any questions or concerns between appointments. Our team at Accurate Hearing Systems welcomes your questions and is here to support you. Accurate Hearing Systems is a state-of-the-art hearing aid provider in Anchorage, AK offering hearing aids and hearing tests in an atmosphere that has a “feel right at home” quality. © [cp_year] Accurate Hearing Systems. All Rights Reserved. Alaska law permits a hearing aid dealer who is not a licensed physician or a licensed audiologist to test hearing only for the purpose of selling or leasing hearing aids; the tests given by a hearing aid dealer are not to be used to diagnose the cause of a hearing impairment. Website designed and developed by Ironistic.